History: Los Angeles-based Rik Pekkonen can be described as the Renaissance man in the inner circles of pro audio. His impressive body of work with a colorful palette of recording artists during the past 20 years attests to his engineering excellence. Past credits include: Larry Carlton, The B-52’s, David Benoit, Booker T. & the MG’s, Garth Brooks, Jackson Browne, T-Bone Burnett, Joe Cocker, David Crosby, The Crusaders, Joe Jackson, B.B. King, Kris Kristofferson, Zigy Marley, Ladysmith Black Mambazo, Ringo Starr, Paul Westerberg, Brian Wilson, Neil Young, Nancy Wilson, Travis Tritt, Aaron Neville, Roy Orbison, Sam Phillips, Michelle Shocked, Dan Siegel, Joe Sample, Iggy Pop and Ricky Martin. Pekkonen recorded BB King’s 2001Grammy winning “Let The Good Times Roll” with Dr. John and engineered Jimmy Smith’s January release “Dot Com Blues” produced by John Porter. The basic band is Smith on organ, Reggie McBride on bass guitar, and Harvey Mason on drums, plus an all-star guest artist list including: Etta James, Taj Mahal, Dr. John & BB King. Rik was last seen with the king himself – actually working on Elvis Presley’s “That’s The Way It Is”, a documentary on the legend’s concert footage produced by Rick Schmidlin. Rik is in the studio with producer Stewart Levine working on Simply Red’s new release with lead singer Mick Hucknall and a stellar line-up including: James Gadson on drums, Freddie Washington on bass, Joe Sample on Fender Rhodes and acoustic Piano, Dean Parks and Arthur Adams on guitar and Larry Williams on synths. Current credits: Rik and producer Stewart Levine recorded with 24 year-old crooner Jamie Cullum. "Twenty Something", the new album by one of the most genuinely exciting new faces on the jazz scene is out in October 2003 and is already a huge hit in the UK. 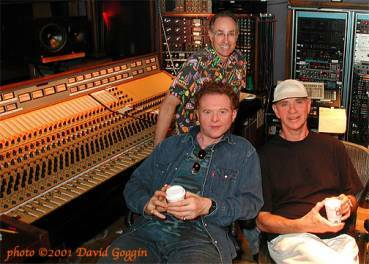 More recently, Rik was in New Orleans recording a Dr. John project with Levine. They're doing overdubs and mixing at House of Blues Studios in LA. Rik's just returned after six weeks of recording Jamie Cullum's new album in London. He starts mixing next week. The album has sold over 2 million.